This did not really happen. Cows' heads did not emerge from the bodies of people newly inoculated against smallpox. 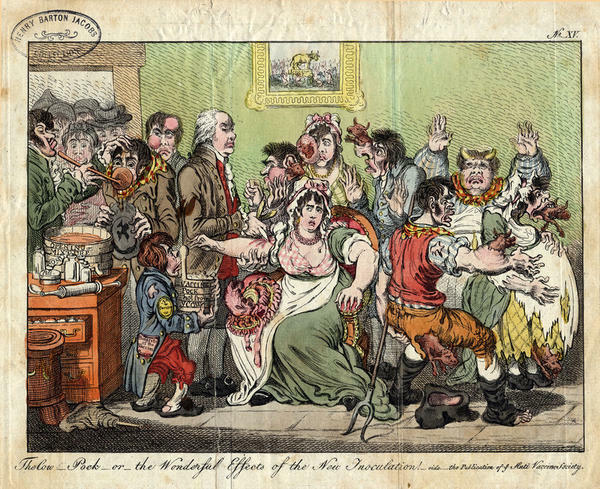 But fear of the vaccine was so widespread that it prompted British satirist James Gillray to create this spoof in 1802. 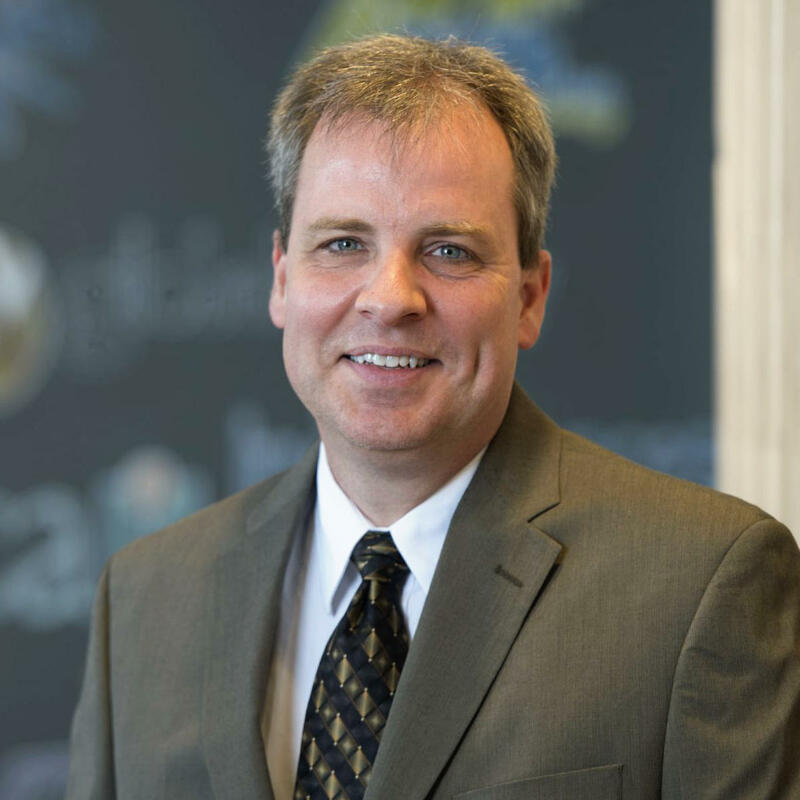 Michael Kinch, associate vice chancellor and director of the Center for Research Innovation in Business at Washington University in St. Louis, released his new book this month, "Between Hope and Fear: A History of Vaccines and Human Immunity." Vaccinations have saved millions, maybe billions, of lives, says Michael Kinch, associate vice chancellor and director of the Center for Research Innovation in Business at Washington University in St. Louis. Those routine shots every child is expected to get can fill parents with hope that they're protecting their children from serious diseases. But vaccines also inspire fear that something could go terribly wrong. That's why Kinch's new book is aptly named: Between Hope and Fear: A History of Vaccines and Human Immunity. He wrote it, he says, to present the science behind vaccines and to highlight the fallacy of anti-vaccine movements. NPR talked with Kinch about vaccines. This interview has been edited for clarity and length. The first attempts to control smallpox go back at least 1,000 years and didn't involve vaccines. Can you describe those attempts? Smallpox was probably killing a half a million people a year in Europe alone. The medical community had adopted a practice called nasal insufflation. You could take a little bit of the material from a smallpox scab, turn it into a powder and have a child snort it into the nose. Or you could intentionally scrape the skin and put material from a smallpox pustule under the skin of a healthy individual. That was called variolation. Those procedures caused smallpox, and people got sick. But far fewer of them died because most people would get a less virulent form of disease than if they were infected through exposure to a smallpox patient. Those who survived were then immune to smallpox. How do you suppose people even thought of doing those disgusting things with scabs and pus? You have to make assumptions. Maybe someone who was caring for a person with smallpox got a cut, and the cut got infected with pus from the patient. Then the caretaker noticed that afterward, they were immune to smallpox infection. Variolation and nasal insufflation worked reasonably well, but they were not vaccines. What is a vaccine? A vaccine is an intentional procedure using killed or weakened germs to trigger an immune response. The exposure to the virus or bacteria allows your body's defenses to work, clearing the germs from the body. With the next exposure to those germs, the body is ready to fight off infection. Vaccines are generally delivered in an injection in the muscle, because the vaccine stays in place long enough for the immune system to detect and fight it. The development of the smallpox vaccine was a breakthrough by Edward Jenner in 1796. What did science learn from the smallpox vaccine? It took about a century for all the lessons to be learned. The smallpox vaccine made people understand that, once you identify a pathogen, you can kill or weaken it. Inoculating people with those weakened or killed forms alerts their immune systems but without causing disease, without causing harm. But first, pathogens had to be identified. A whole slew of discoveries happened from the 1880s through the early 20th century. People discovered anthrax bacteria, discovered measles, mumps, rubella viruses, discovered diphtheria, pertussis and tetanus. Then scientists could weaken or kill the germs and create vaccines. Which vaccines does the world most need now? The two holy grails are an AIDS vaccine and a universal influenza vaccine. AIDS has proven particularly challenging because the virus mutates very rapidly, and AIDS has found really good ways to circumvent an immune response. And the influenza virus changes constantly. It kills 30,000 to 40,000 Americans a year, and every few generations, there's a pandemic. Exactly 100 years ago, we had the Spanish flu that wiped out tens of millions of people. There are others. The current scourge of the world is malaria. The organism that causes it can change and thus hide from a vaccine. New pathogens always arise, and with global warming they're working their way north, where they haven't been seen before. The current anti-vaccination movement fears that vaccinations are linked to autism, though the original study suggesting the link has been roundly discredited. Were there always "anti-vaxers" throughout history? The anti-vax movement is actually older than vaccines. There was a well-established anti-variolation movement when people were using scabs and pus to try to prevent smallpox. Lady Mary Wortley Montagu was the wife of the British ambassador to the Ottoman Empire and a progressive thinker. She strong-armed the embassy physician to perform variolation on her four-year-old son in 1715, but her husband was opposed to it and she had to do it behind his back. Have there been scientifically valid reasons for people to fear vaccines? There have been mistakes. When Dr. Jonas Salk announced his polio vaccine in 1955, bells were rung around the country to celebrate. But as people started getting immunized, Cutter Laboratories, which manufactured the vaccine in California, didn't properly prepare the vaccine. A lot of kids were unintentionally infected with polio, and the incident created a lot of fear. (According to the National Institutes of Health, 40,000 cases of polio were caused by 200,000 vaccinations from the bad batch; 10 children died and 40 were left with varying degrees of paralysis). Vaccines aren't perfect. But there's no substance in the world, including water and oxygen, that is entirely safe. Why did you write this book now? I saw that things were getting worse. It's becoming more expensive to develop vaccines and less profitable. We haven't developed a novel vaccine in decades. Pharmaceutical companies are abandoning vaccines. The anti-vax movement, I would argue, is stronger than ever. They're highly organized, highly motivated and well-funded. Susan Brink is a freelance writer who covers health and medicine. She is the author of The Fourth Trimester, and co-author of A Change of Heart.